20170113 - Up in the am and in to work. Very fast and furious start. Worked hard all with a couple of calls to car place; I let them know exactly what I wanted and how much I would pay... Finished the day looking a head of next week a bit. Called the dealership on the way out the door and they agreed to my terms! Home got LJ&G and we headed to Ricart. We had everything negotiated before we showed up, we pulled in, they had the cars lined up so all we had to do was pick the color. 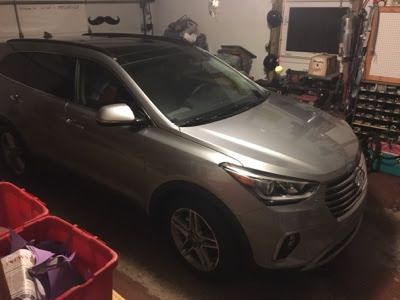 Did the paperwork and headed home in our new 2017 Hyundai Santa Fe. The boys rode home with me, flicking every switch, pushing every button and gazing out of the glass ceiling, not a sun roof, the whole roof is glass :-) We swung through Burger King and picked up some dinner and headed down to the basement to watch the new Alice through the Looking Glass, it was pretty good. All boys to bed. I stayed up WAY too late reading the manuals and trying to figure out what all this new machine does.